Bearing glossy red fruit, phrases like “Canada Choice” or “prepared in Canada,” and other subtle hints, the packaging on apple juice gives Canadian consumers the impression they’re drinking apples from this country. Don’t let those labels fool you: Most of the juice found on grocery store shelves is made from cheaper foreign apple concentrate that’s been flooding into the Canadian market over the last few decades. Watch Marketplace at 8 p.m. on Friday on CBC TV and online. Consumers are at least partly in the dark because Canadian juice-makers don’t have to list the origins of their ingredients under Canada’s food labelling rules — and the government agency that controls labelling has no plans to change that policy in the near future. In a given year, Schuyler will produce 4,500 tonnes of apples in a dozen varieties. But he estimates that less than five per cent of his harvest ends up in cartons of apple juice sold on store shelves in Canada. Marketplace reviewed the labels of about two dozen apple juices produced by large-scale Canadian juice-makers and stocked by major grocery stores — and found a handful that advertise they are made with Canadian apples, including Graves McIntosh Apple, Oasis Classic (not from concentrate) and Tropicana Pure Premium (1.75 litre). 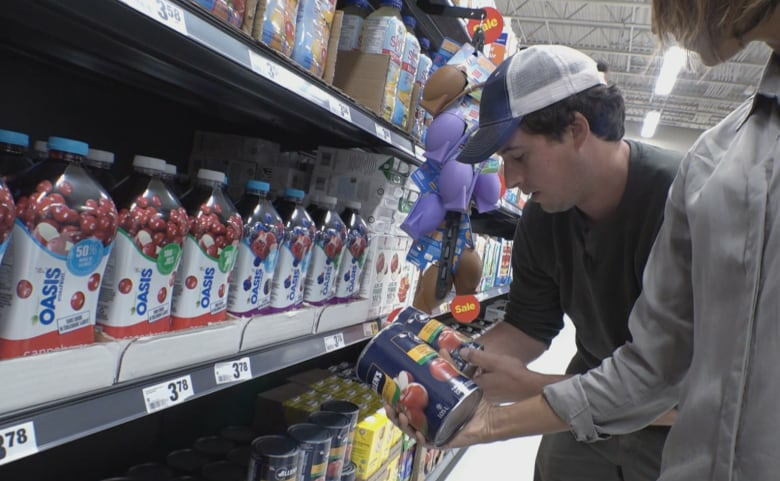 It’s a different story south of the border, where since 1987, U.S. Customs has insisted that manufacturers indicate country of origin on their juice labels. It’s that kind of transparency Schuyler says is missing from Canadian shelves. “It is a great example, looking at what they’ve done in the States to just put it on the label. Clear country of origin labelling would be a very good thing to see in Canada,” he said. Food lawyer Glenford Jameson, who works with companies to ensure their labels meet Canadian standards, says country of origin requirements on juice is a “voluntary statement” in Canada. While apple juice labels aren’t legally required to list the country of origin, similar to a number of fruit and vegetable products prepared in Canada, the Canadian Food Inspection Agency (CFIA) does require the labels to include company information. In an attempt to learn the source of apples for some of the most popular juice brands sold in Canada, Marketplace contacted the customer service departments of five different companies. The agents we reached told Marketplace that their juices were produced with apple concentrate from China, Poland, Argentina, Chile, New Zealand and the U.S. as well as with “some” apples from Canada. With its massive orchards and cheap labour force, China has become the world’s largest producer of apple juice concentrate over the last few decades. China is also the number one supplier of apple juice concentrate to Canada, far outpacing other countries, according to Statistics Canada and the World Apple Review. Last year, nearly 30 million litres of apple juice concentrate alone was imported into Canada from China. Apple concentrate is produced from apple juice that is boiled down into a thick liquid, packaged in plastic-lined steel drums and transported around the world by tankers. Once in Canada, the concentrate is mixed with water and reconstituted into a drinkable juice. Marketplace also reached out to Canada’s largest apple juice-maker, A. Lassonde Inc., to ask about the source of its apples or concentrate. For farmers like him, growing and selling apples for juice is no longer worth the squeeze. Like many Canadian apple farmers Schuyler focuses on cultivating large, perfect eating apples which fetch a higher price than juice or “salvage” apples. “It’s just pure economics,” he said. Schuyler says he is paid about 25 cents a pound for fresh McIntosh apples for eating, for example, compared to just five cents a pound for undercoloured, small, bruised or misshapen fruit that don’t meet the standard of perfection for produce aisles. That means he makes no money selling juice apples — because it costs him about that much per pound to harvest them. And there is little incentive for Canadian juice-makers to pay local apple farmers higher prices because of the plentiful supply of cheap, foreign concentrate. 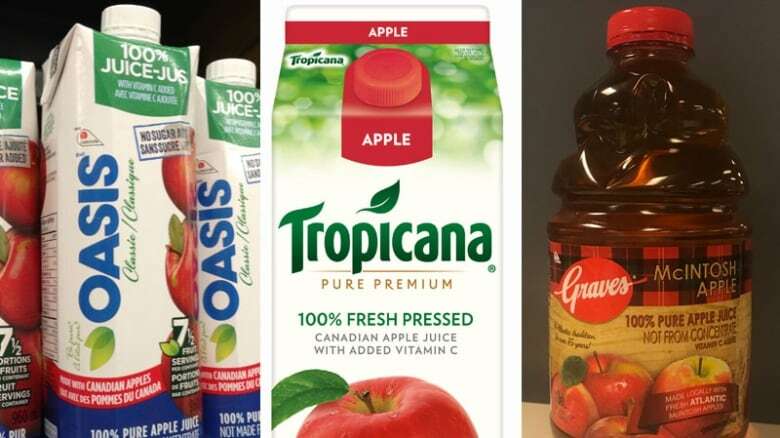 The CFIA is currently reviewing its labelling practices in Canada, though the agency said there are no plans to change the rules around apple juice labels in the future. And while the CFIA won’t force companies to add country of origin information, the agency “encourages” companies to add those details for consumers, said Aline Dimitri, executive director and deputy chief food safety officer. The current labelling policy is also about balancing consumer need for immediate information and industry need for flexibility, Dimitri said. And if the answers consumers seek are not forthcoming or complete, Dimitri urges Canadians to contact the CFIA.